It's strange how that's all twisted around, no? 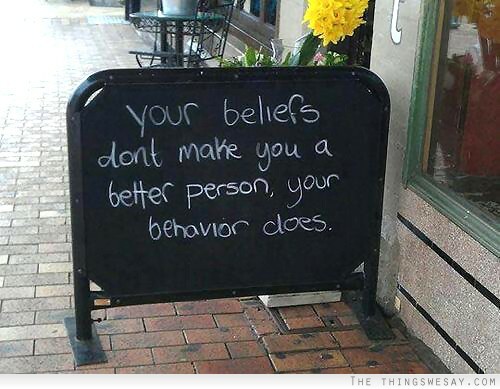 As if our actions are not governed by our beliefs. But why should we be surprised? Have our churches not authoritatively taught us from the word of God that we're "just sinners saved by grace?" such people didn't make the bread and leaven connection? Do they not understand that it is not God waiting for the right opportunity to expose our sin, but it is our actions driven by our belief systems that will be heard in the light and proclaimed on the housetops? A belief may indeed be reflective of a reasonably valid conviction and perhaps even truth, but a belief or conviction that does not govern your behavior is one of the purest examples of hypocrisy: it is a fantasy only to be trotted out when necessary to persuade others of a moral fortitude. If you want to understand your belief systems, if you want to know what is at the core of your being, then look at your behaviors, and look at your thought patterns, look at the private sins you confess that no one knows about, look at the disparaging remarks you make of others whom you disagree with - especially those done in jest. Delve into those things and you will find the lies you confer as truth (John 8:34-38). In other words, if your actions smell of evil, its because your belief systems do too.